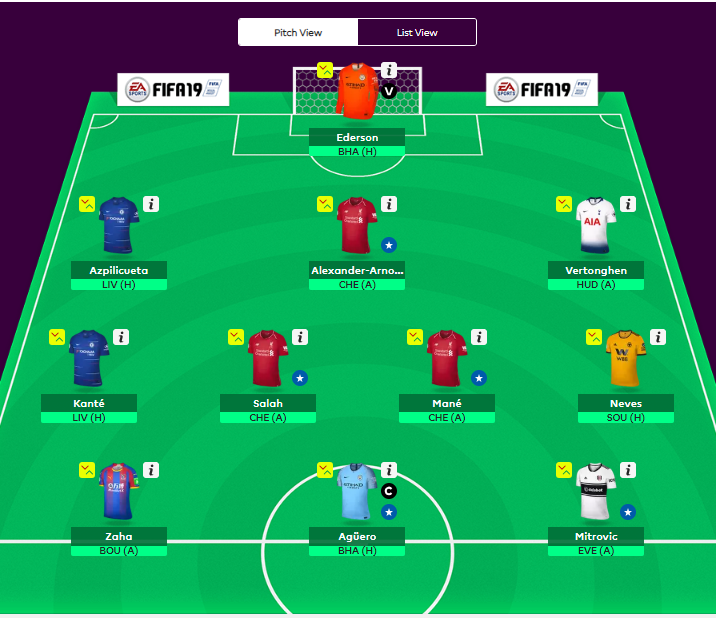 Sixty-one points from Game Week 6, rewarded for keeping some tangible faith with Alexander-Arnold as the City contingent in the side continue to generate points for fun. Mitrovic came in and did a job against Watford. An interesting week beckons this time round with the meeting of Chelsea and Liverpool. Hawkeye Sidekick is more hoping than optimistic at this stage. Ederson is such a solid pick right now in the keeper position. The number of clean sheets alone so far this season has being impressive and his ability to launch swift counter attacks. Six points last week, hoping for more this weekend with the Brighton & Hove Albion visiting the Etihad. The Chelsea and Liverpool player clash starts with the back line. Alexander-Arnold and Azpilicueta are in the back three, both players could have torrid afternoons given the pace and speed of the attacking units on display. I am not hopeful on either this week, grin and bear and hope neither player does not get booked (wishful thinking). Vertonghen is hopefully the saving grace for the back three this weekend. A trip to Huddersfield, a clean sheet and perhaps a goal from a set piece would do nicely. Tottenham need a result after a torrid couple of weeks in the league; they should get the job done here against a Huddersfield Town side who are neither scoring enough or preventing goals defensively. The midfield four again has a Chelsea player (Kante) and two Liverpool players (Mane and Salah). I am rather pessimistic that there will be a goal fest at the Bridge (hoping for it) but need to be realistic given the curse of the Sky Sports advert campaign. Neves comes into the picture and it is a time for him to impress. Wolves play Southampton who look quite shaky as of late. Neves has to increase his attacking threat in the final third; hope (yet again) that the Portuguese midfielder will deliver a man of the match performance. Mark Hughes is under pressure at Southampton as it is and I think it intensifies after this fixture. Wolves if they have their shooting boots on could win well. The front three are unchanged. My best mate Mitrovic scored against Watford but anyone else feeling that Mitrovic is going to do something stupid and get sent off. I cannot think like that in team selection so he retains his spot and a game against a vulnerable Everton outfit could see the Serbian striker score another goal. Sergio Aguero is a points machine. He is having an outstanding season and that run of fantasy league points looks set to continue with the trip of Brighton & Hove Albion who will try to sit deep but think City are too slick in their passing. An early strike and BHA get opened up which will be music to the ears of Aguero. Mr. Crystal Palace continues as the third striker. Zaha plays a Bournemouth side smarting from their 4-0 drubbing on the road to Burnley last weekend. MNF game for Zaha to flex the muscles and suspect that Palace will score a goal on the road and inevitably Zaha will be key from an attacking perspective. This entry was posted in soccer and tagged fpl. Bookmark the permalink.